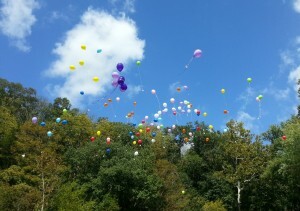 Recently, I was honored to be asked to sing at a balloon release for The Compassionate Friends in Frankfort, Kentucky. We have a lovely little memory garden in a park near my home. Surrounding a central bronze statue of children at play is a circle paved with bricks. Those bricks are inscribed with the names of loved ones who have moved into the next life. One of them has my sister Cyndy’s name on it. Outside that circle are benches and rocks large enough to sit quietly listening to the sound of the nearby stream. Each year, new bricks are added. Each year we say a few words, read the names of the newly minted bricks and share a moment or two of silence. We remember and we grieve. We celebrate those lives and we long for reunion. This year, after the time in the garden concluded, we moved out into the meadow. Our gathering of loving, hurting, caring, grieving, wonderful people tied messages to balloons. 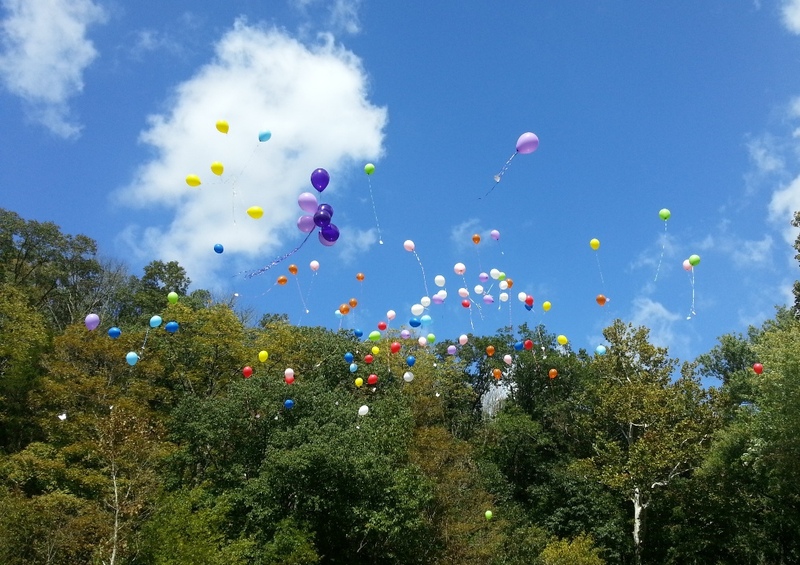 Our regional coordinator counted to three and dozens of purple, white, pink and blue balloons were set free to rise above the trees and up into a beautiful blue sky. I couldn’t tell you what was more amazing; the sight of those dancing colorful dots seemingly on their way straight to heaven, or the wistful loving smiles on all those faces as they shaded their eyes and stared up into the sky. There is a sense of family at these gatherings. We find ourselves standing with other people who share this bond of emotion and experience. For a time, we know that we are not alone. For a time we feel sympathy without pity. We feel in a way, empowered to feel whatever is in our hearts, without judgment or discomfort from anyone. After the balloon release, we walk down out of the meadow to share a pot-luck meal. The group extends support and understanding to any and all who come. Friends share news and new friends are made. There are tears, but also smiles. There is hope here and we trust in it’s sincerity. For the occasion, I wrote a short song about something we all have in common. A stubborn love. A love that will not shrink away with time or allow itself to be denied. What the rest of the world doesn’t seem to get is that we’re not trying to hang on to our pain and grief. We just won’t let go of the love. Should we? Does it make any sense to try and wipe away something that made us better? Make no mistake, real love does make us better. We learn self sacrifice and devotion and loyalty and all kinds of virtues when we love someone. 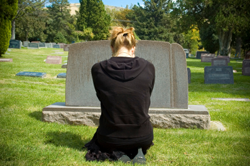 When we suffer the loss of that loved one, why must we also lose the love? Why would anyone ask us to? It’s true, we must all get out of bed and live our lives as best we can, even in the wake of devastating grief. But if someone asks you to “get over it” or ” let it go”, remember that we are on a journey that has no set speed or designated way points. We’re just doing the best we can to keep breathing, living and loving one day at a time. So today, I want you to know that it’s quite all right to answer those who ask the impossible question , ” don’t you think it’s time you let go?” With four simple words. ” I don’t think so.” With that thought, I wrote the following poem and set it to music. but I say- I don’t think so. But I won’t leave my love behind. The day when pain is over for us all. I’ll say – I don’t think so. I hear- I don’t think so. But we won’t leave our love behind. we’ll say – I don’t think so. Thank you for this beautiful post (I could picture the gathering) and for your beautiful song. Do I have your permision to read the lyrics at talks I give? Yes ! With my blessins. Thank you for adking.